“Every chance they got, the kids were all over us, 3-4 deep, waiting for a chance to play,” says our CEO, Michael Fergusson, about the enthusiasm the kids had over the game. 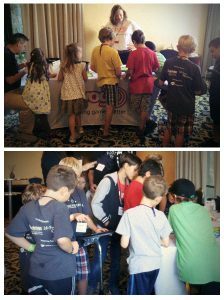 The call for Monster Manor Beta Testers was launched on Friday at the Children with Diabetes, Friends for Life Conference in Vancouver. The game proved very popular. Some kids were waiting at our table to play first thing in the morning, before we even had the chance to set up. The features of the economy that limited gameplay to a few minutes at a time were turned off for the conference so we ran into the problem of kids playing non-stop. The game was so fun and engaging, a few moms gave us a hard time because their kids wouldn’t stop playing to eat lunch. We will, of course, have the time limit features turned on for the beta test release! 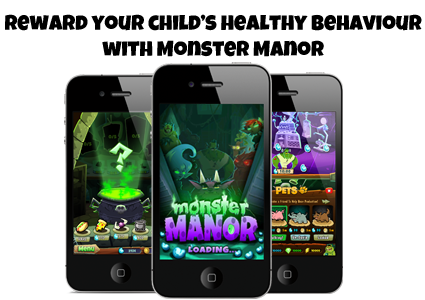 Monster Manor is a free game that helps families of young children with Type 1 diabetes stay on top of their testing and logging schedule. The game is integrated with the BlueLoop diabetes tracking app, which allows children to effortlessly enter all of their diabetes information and allows parents to monitor and stay informed anytime, anywhere. Every time children enter their BG information into the BlueLoop app they are rewarded with a piñata to crack open in Monster Manor. Piñatas hold all sorts of fun inside, from “Beanz” that will help children collect more monsters, to “Gold” that will buy their monster new pets. In addition to rewarding kids, parents are provided with insights, strategies and a tool to support their child’s management efforts. Parents can also send their child an extra special piñata that has a better chance of winning bigger prizes! This is designed to give parents a daily opportunity to show support to their child and give them the encouragement they need to properly manage their diabetes and improve their treatment adherence. The beta-tester program is by sign-up only. In order to participate, kids and their parents will have to beta test together. Potential tasks include smashing piñatas, collecting monsters (in other words, play testing) and filling out surveys. Not only will beta testers get a pre-released, top secret look inside Monster Manor, they will also be helping us build a better diabetes management game for children that will engage them in becoming healthier. The call for beta testers ends September 6th. The beta-tester program is slated to begin mid-September. If you know anyone who would be interested in participating, please share this news with them.